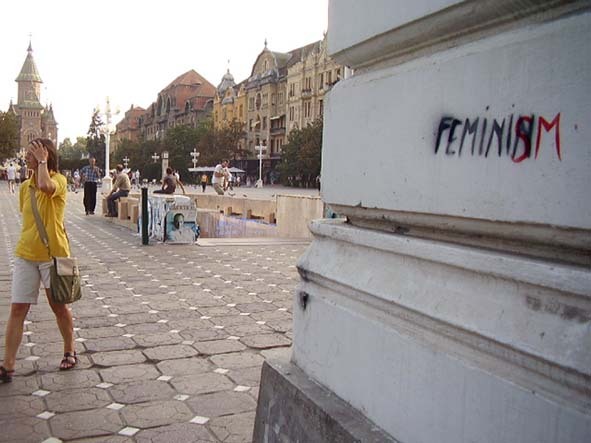 “Feminism” is a difficult word to use in present Romania. After the emancipatory politics of the early communist regime, that at the beginning of 1950’s led to a development of women movement, later, during the regime of Ceausescu, “emancipation” and “feminism” became only empty words, covering the gloomy reality of the thousands of deaths of women as a result of the pronatalist politics. After 1989, during the transition time and in the present women and men publicly declaring themselves as being feminists have to face a double blame. On the one hand the word carries the implications of the former communist regime, and on the other hand, in the present mostly conservatory public discourses, “feminism” is generally considered as being a concept “imported from the West” that has no relevance for our society based on “Christian” rules. As condition to the integration in the European Union, Romania adopted a series of laws with a gender content (the Law for Preventing and Combating all Forms of Discrimination (2002), the Law on Equality of Opportunity between Women and Men (2002), the Law for Preventing and Combating Violence in the Family (2003). The adoption of these laws is an important step in the struggle for gender equality. But still, the fact that these laws where adopted on a purely legislative level, without the appropriate institutional frame that would put them into practice, and the fact that their adoption was a result of external pressures and not an outcome of the pressures made by the civil society, by the ones whom these laws are actually addressing, all these are diminishing the effectiveness and the power of change of these laws. These laws are reflecting the “democratical” face of capitalism. Aspects with an important gender content, such as precarity, poverty, migration, aspects that have as a direct result violence and discrimination, are not under the incidence of these laws. If you consider that you live in a society where all the gender issues were successfully normalized, then the problems that you are actually living are becoming only your personal failures, without any general relevance. The illusion of normality that these laws are creating have an effect of desolidarization, in the conditions of a society where all the facets of life are commodified and where living beings and ideas are important only if they are contributing to the accumulation of capital. An efficient discussion about patriarchy can be made only if its connection to capitalism is clearly shown, only if the network of privileges and power, on which global capitalism is structured, is analysed. A discussion that would not limit itself to the listing of different forms of oppression but that would refer also to the responsibility that each of us has to oppose these oppressions. Feminisms is a tool for analysis and action. Feminisms is a structure that brings together different initiatives, with their different purposes and approaches, a structure that creates a platform for discussions, interactions, alliances, for a multiple definition of the term “feminisms”, a definition that does not take the form of a label but that is a mobile and flexible basis for interpreting and for acting. Feminisms is an artistic project that is motivated by our need to demonstrate that there are alternatives, that there are efficient tools by which a reality always seen as a monolith, all-encompassing and unchangeable can be questioned and transformed. Even if this transformation is constructed out of small gestures.